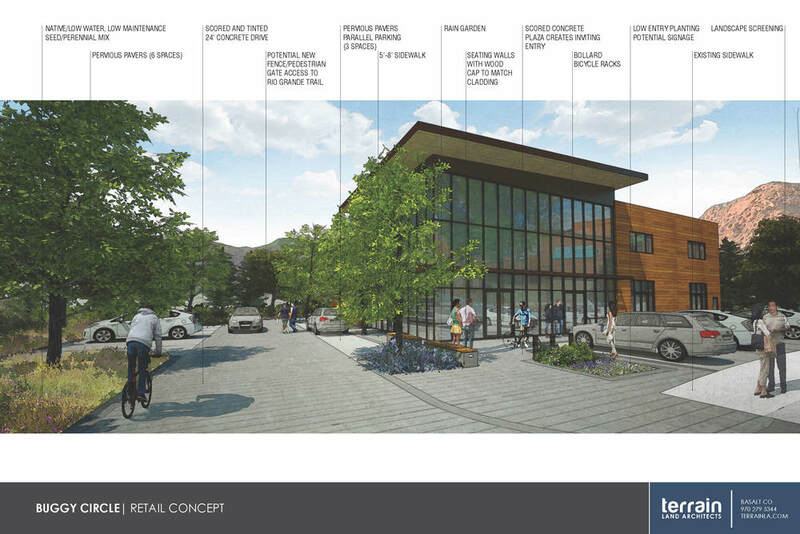 ALA worked with a local architect to develop concepts for repurposing a 13,000sf commercial building in Carbondale, CO for retail and office use. ALA provided visioning, illustration, massing studies, site planning, and participated in site plan review with the town. The site concept proposes a curbless drive condition with pervious-paved parking bays to convey a sense of quasi-urban, pedestrian-friendly environment. Large glass storefront is framed by rain gardens and seating walls to enhance the streetside retail visibility. The constrained site required creative space planning to meet parking requirements while maintaining minimum landscape/impervious area, fire access, and planting guidelines, while balancing the needs of the client’s program.